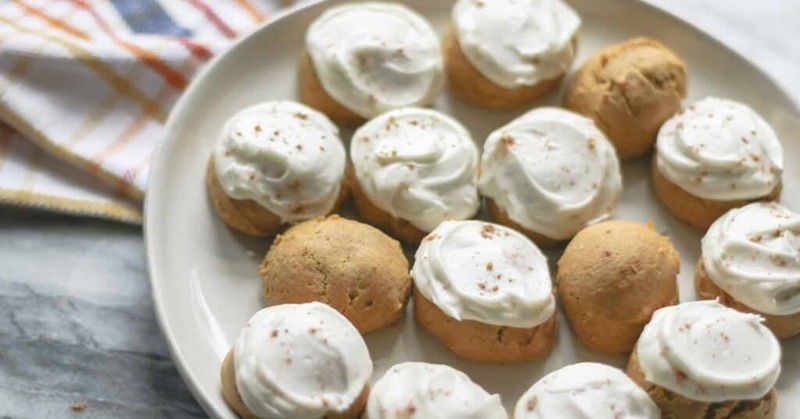 If you love a soft cookie, these Gluten-free Pumpkin Spice Cookies are for you! Fall isn’t over quite yet so that means it’s still pumpkin season, right?! Plus, I’ve got about 12 cans of Libby’s pumpkin in my pantry so I decided to put some to good use and make these awesome Pumpkin Spice Cookies. Really though, these cookies aren’t just for fall! I know I’m going to have that pumpkin hanging out in my pantry for a while so technically any season is pumpkin season! So, why make these Pumpkin Spice Cookies? You know those frosted pumpkin bars? We’ve all had those right? 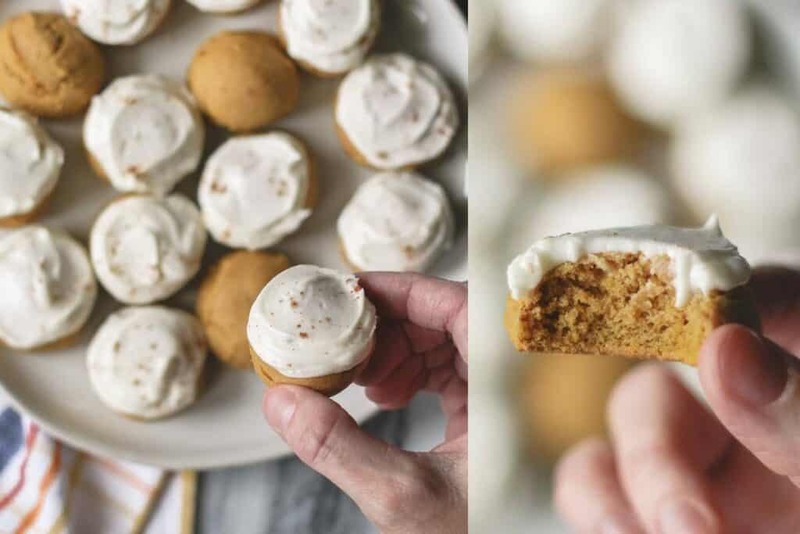 These Pumpkin Spice Cookies taste just like frosted pumpkin sheet cake in cookie form! 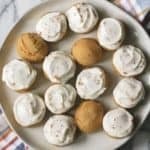 They are soft, filled with spice and pumpkin flavor, and topped with that delicious cream cheese frosting. They’re so cute and the perfect bite-sized treat! Of course the cookies are also gluten-free and pretty easy to make. First we’re going to mix the wet ingredients. Milk, butter, egg, vanilla, pumpkin puree, and brown sugar. Cream the butter and brown sugar first, then add the rest and mix well. Then we’re going to mix in the dry ingredients: Gluten-free flour, baking powder, baking soda, and spices. As you can see, I don’t get to fancy or technical, just dump and mix well. I used Pamela’s Artisan blend All-Purpose Flour (affiliate link). It is my go-to gluten-free flour blend. 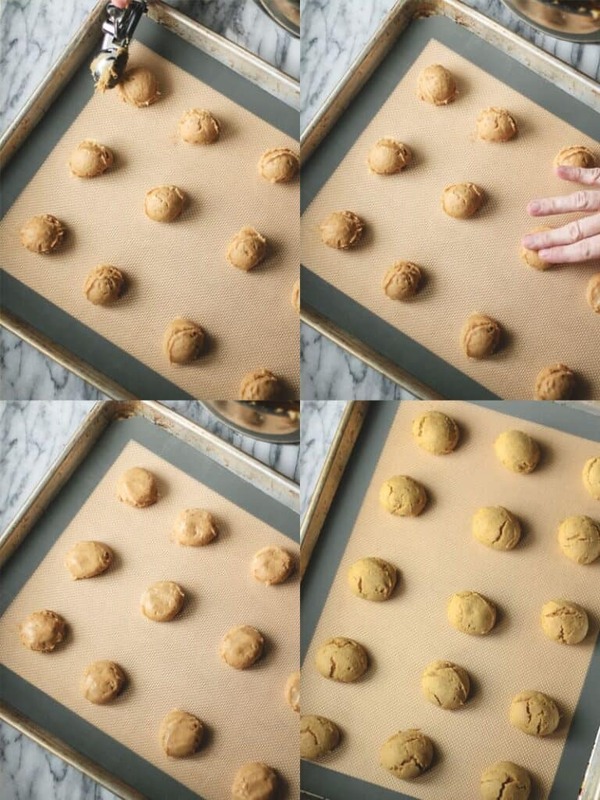 Then portion the cookies out onto a parchment lined sheet, non-stick pans, or pans lined with a silicone mat. Wet your fingers with a little water. Press the tops down slightly and smooth out any weird peaks. The cookies don’t spread much in the oven. Bake them up and then let them cool before frosting! Speaking of frosting… classic cream cheese frosting is the perfect compliment to these cookies. 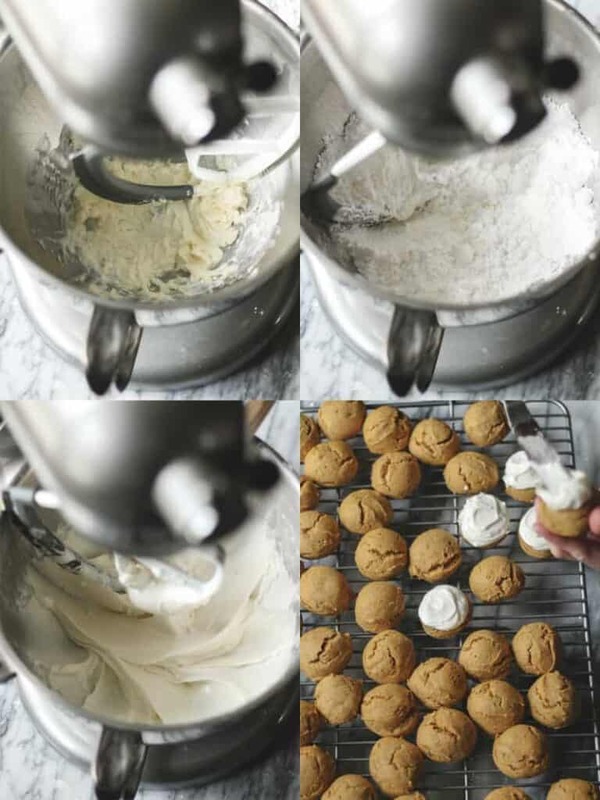 Cream cheese frosting is really easy to make, softened cream cheese and butter get mixed together. Then mix in powdered sugar and milk until you get a spreadable consistency. The frosting covers any cracks or imperfections in the cookies, which is awesome! Not to mention, the cream cheese frosting takes these cookies to the next (and necessary) level! I mean seriously, don’t you just want one? 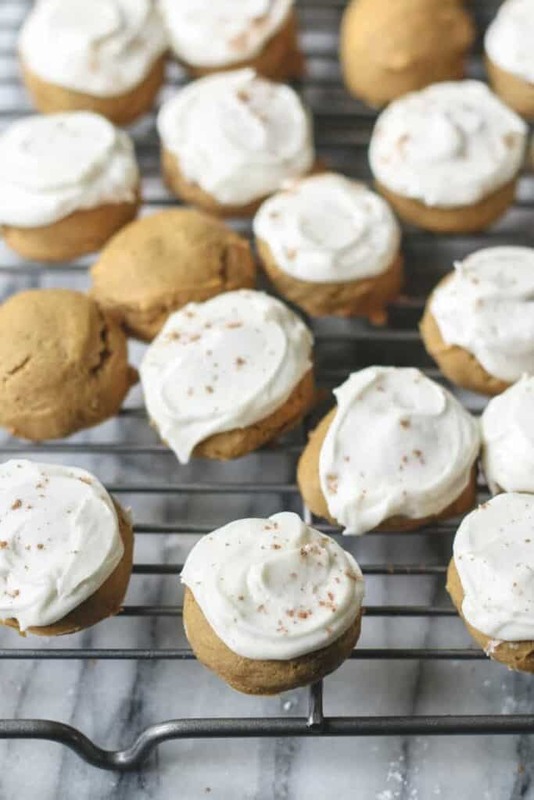 For an added touch of whimsy, cuteness, or whatever… sprinkle a little pumpkin spice or cinnamon on top of the cookies right after you frost them. So cute! Soft cookies filled with pumpkin and pumpkin spice! Topped with Cream Cheese Frosting. 1/4 teaspoon xanthan gum omit if your flour blend contains it. Preheat the oven to 350°F. Line two baking sheets with parchment, silicone mats or use non-stick sheets. Whisk the dry ingredients (GF flour, baking powder, baking soda, salt, cinnamon, & pumpkin pie spice) together in a small bowl. Set aside. 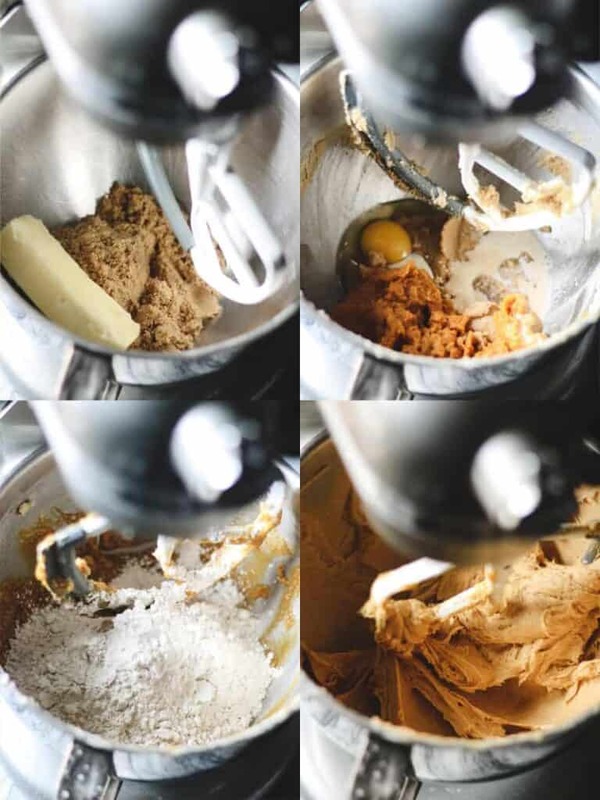 Place the butter and brown sugar in the bowl of a stand mixer. Cream together until light and fluffy, 1-2 min. Add in the pumpkin, egg, vanilla, and milk. Mix until well combined. Drop by tablespoonful onto prepared cookie sheets. Bake 10-12 minutes or until bottoms are lightly golden and cookies spring back when tops are touched. Allow to cool completely before frosting. Add in the vanilla and powdered sugar. Mix until well combined. Add in 1 Tablespoon of milk and mix. Continue to add milk by the tablespoon and mix until the frosting has a smooth, spreadable consistency. Frost the cooled cookies and sprinkle with cinnamon or pumpkin pie spice if desired. I hope you enjoy these delicious little cookies! As always, feel free to share and rate my recipes below! These cookies are addictive! They taste like the best pumpkin cake. It’s hard to believe they’re gluten-free. I give this cookie five stars for sure! !